Nature-based tourism activities include beach activities, recreation on both freshwater and the ocean, as well as on the marshes. Other opportunities can be found through walking/hiking, biking, camping and wildlife watching. When visiting Darien be sure visit Georgia Buffalo to get an up-close and personal experience with these iconic American animals. Then board the ferry over to Sapelo Island, which is awash in natural resources. Bring your binoculars! While in Darien be sure to indulge in some waterfront dining at Skippers Fish Camp. Okefenokee National Wildlife Refuge in the Folkston/Waycross region is a national treasure. 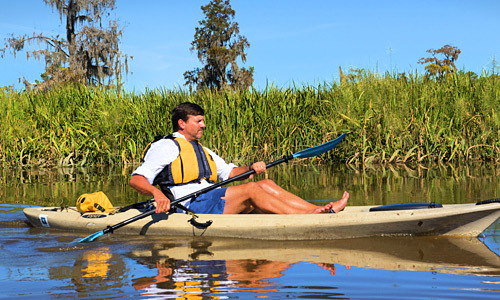 Your exploration should begin with Okefenokee Adventures and one of their guided boat tours. Watch for alligators basking in the sun and the birds and flowers decorating the landscape. The Laura S. Walker State Park is in this area so take advantage of their campgrounds and 120-acre lake. When you are in the Golden Isles journey back in time at Fort Frederica on St. Simons Island, renown for colonial history but also opportunities to stroll the grounds experiencing marsh and river ecosystems. Be on the lookout for a variety of birdlife and maybe even nesting diamondback terrapins. Stop for lunch at The King and Prince and its Echo Oceanside Restaurant for some beachfront dining. Then head to the Jekyll Island and hop on one of the Jekyll Island Dolphin Tours offering dolphin tours, wine cruises and private excursions. Reservations are recommended. In Savannah, head out to Skidaway Island State Park. There you will not only find camping and picnic areas but miles of trails for hiking and boardwalks across the marshes. Then travel over to Oatland Island Wildlife Center a place of conservation, education and discovery. Experience dozens of native species firsthand including wolves, cougars and bald eagles. Grab a bite to eat after that at The Lady & Sons. Cumberland Island National Seashore, found in St. Marys, has outdoor activities like camping, hiking, biking, and bird watching. Birds aren’t the only wildlife around so look for Cumberland’s famous wild horses. Plan accordingly because the only way to the island is by ferry. The nearby Crooked River State Park is also not to be missed with its beautiful maritime forest. Opportunities for camping, hiking and birding are all available.